Throughout the old town of Ribadavia there are numerous small squares and plazas and we also found two great little miradors (viewing points), one looking over the river and new town and the other across the valley below. The latter of these two miradors was paved and had benches bathed with dappled light from the established trees standing behind them. Moving back to Ribabavia’s links with the Jews, the main Jewish area had one of its original houses used as a synagogue and shields and plaques now denote this building. Various religious insignia, including the Star of David, also appear on the houses cast iron gates. Walking around Ribadavia’s old quarter really is a pleasure and it compares favourably with every other Galician town we have visited. Even when we ventured into the newer districts of the town it was still pleasing and a large church and convent, the Iglesia y Convento de San Fransisco faces the old town on the opposite side of the river bank. I believe still in active use, this convent has been occupied by Franciscan monks for almost 600 years and the Galician Baroque styling and numerous examples of stone carved heraldry make it worth a visit. 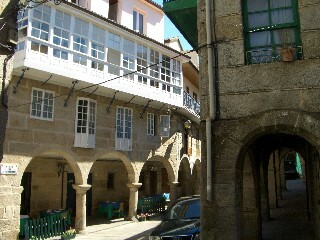 If you like the Galician style of architecture which, at its best, offers small and often multi terraced buildings in an uneven but interesting mix of styles, projections and heights, Ribadavia will come up trumps. It also has numerous churches, tiny squares at every other turn and is famous for its pastry and cakes – which I can personally recommend. 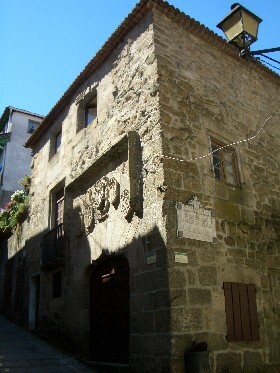 Additionally, Ribadavia has very few of the dilapidated and crumbling down building ruins that literally plague even the best parts of Galicia and the people are friendly and welcoming of visitors. You can also be sure that, given its relative isolation, you will be one of the few foreign visitors who venture this far into inland Galicia. 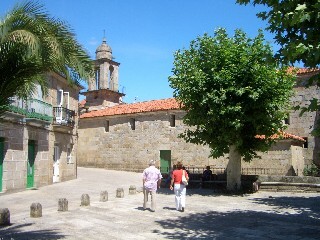 We genuinely thought Ribadavia to be one of the best towns in Galicia. Its main square, proliferation of churches and superb medieval quarter make it stand out ahead of just about every other town in the region. 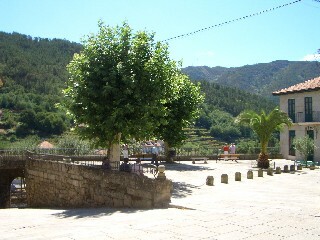 The town literally is without flaw and the only downside we could find to visiting it is its rather isolated location. However, even that can be defended as the scenery in this part of Galicia ensures that any drive to Ribadavia is conferred with the best views in the region. In summary this is definitely one Galician town you do not want to miss.